Easter Island has been known by a great many different names 26, such as: Hititeairagi or Hiti-ai-rangi; Tekaouhangoaru; Mata-Kiterage (Eyes Looking at the Sky); Te-Pito-te-henua (Navel of the World); Rapa Nui (Great Rapa), a name used predominantly by whalers; San Carlos Island, the name given after Don Felipe González took possession of the island in 1770 in the name of the King of Spain; Teapi, the name used by Cook; Vaihu or Vaihou, also used by Cook and later by Forster and by La Pérouse (whose name is associated with a small district on the south coast 27 of the island); Easter Island (because it was discovered on Easter day 1722 by Roggeveen, a Dutchman; and I’ile de Pâques (by the French) 28. The island is located almost half way between Chile and Tahiti, at 27º 8' 24" south and 110º 45' 50" east. It is 2,600 miles from Valparaíso to Easter Island and from there it is another 2,750 miles to Tahiti 29. The Chileans estimated that the island has a surface area of 118 square kilometers, while Admiral Lappelin estimated an area of 11.773 hectares. In fact, the area is about 180 [square?] kilometers 30. The island is triangular in shape, with a southeast base line. The three sides are, respectively, 16, 18 and 24 kilometers long. At its greatest width, the island is 19 kilometers wide. The island is entirely volcanic in origin and there is a dormant volcano at each corner of the triangle: Rano Kau at Mataveri; Rano Aroi, near Mt. Terevaka; and Rano Raraku in the region known at Hutuiti or Otuiti 31.
i. Rano Kau is 408 meters high according to the officers of the O’Higgins. It is the largest of the three volcanoes. It is perfectly circular and is more than one kilometer in diameter and 250 meters deep 32. This volcano is remarkably symmetrical and all around it the ground is flat 33. The southern part of the crater drops away precipitously to the sea. The view of the entire island from the top of the crater is magnificent. In the sea beyond the volcano, at a little distance, are several small islets (motu), the largest of which is Motu Nui, which in times past played a major role in the annual election of the warrior chiefs. ii. Rano Aroi, the highest of the volcanoes 34, rises about 540 meters above sea level. iii. Finally, Rano Raraku is an oval crater that is about 300 meters high. The slopes of the crater, which is about 600 meters in diameter, fall away gently until a depth of 100 meters 35. On the interior slope, in the southeast, there are three groups of monumental statues which, if they have not fallen over, face towards the north 36 (Figure 1). Within these craters there are great pools of fresh water, surrounded by reeds (Figure 2). In addition, on the interior slopes of Rano Kau, there is a grove of hau 37and toromiro 38. On the interior slopes of all three volcanoes, plants grow much more vigorously than they do elsewhere on the island because the soil is of better quality, because there is no wind, and because the rays of the sun are concentrated in the craters just as they are in a greenhouse. The profile of the rest of the island is quite uneven and there are a few little hills, between which the ground is covered with grasses and forms flat areas and valleys of various sizes. The terrain is composed of volcanic dust, the result of erosion by the air, and decayed vegetable matter; of volcanic scoria; and of flat stones (which the natives use for building). The depth of the dirt for planting ranges between not more than 10 to 40 cm 39. In the north of the island, there are some sandy areas that the islanders prefer for growing sweet potatoes and yams. There are two seasons on Easter Island: the wet and the dry. It rains very frequently in the winter, but the showers do not last long. The summers are very hot, with February and March being particularly hot, but the heat is bearable because of the constant breezes. Throughout most of the year, the island is buffeted by the wind. In spite of the rains during the wet season, there is not a single stream or freshwater spring on the island 40. The rainwater infiltrates the ground and forms subterranean streams that flow to the sea. At the points where the streams emerge at the coast, the ancient islanders built stone receptacles to capture this rare and precious, sweet water. Unfortunately, contamination and, frequently, inundation by seawater at high tide often polluted the fresh water. The islanders also built reservoirs, some large and some small, at various sites on the island to catch the rainwater. It is worth noting that the bedrock contains no traces of minerals. All the rock is volcanic (trachytic, basalt, obsidian, rhyolithic, etc. ...). Near the area known as La Pérouse there are cliffs of red lava, with scattered caves (in which there skeletons can be found). Let us conclude these generalities by saying that when Pinart visited the island, he found homes at various sites and, in particular, at Mataveri, and that he saw, at a little distance, the remains of the church of the Picpus Fathers. Last of all, the island is surrounded by several islets: Motu Nui, Motu Iti, Motu Kao Kao, Motu Tautira, and Motu Marotiri (in the southeast). On July 16, 1721, Admiral Roggeveen left Amsterdam, with soldiers and three Dutch ships, namely, the Thienhoven, the Arent, and the Afrikaanse Galley, on a voyage to unknown lands in the Southern Hemisphere. After many difficult days at sea, he landed on April 6 1722 on an island that he named Paasers, which is the Dutch for “Easter”, in commemoration of the day that had preceded the discovery of this island 41. There are some who think that, long before Roggeveen’s landing on the island, the pirate E. Davis, sailing south from the Galapagos Islands on the Batchelor’s Delight, had seen the island in1686, without dropping anchor there. This seems hardly likely, given the description that he left and given the fact, moreover, that the Dutch admiral wanted to look for the island that Davis mentioned after he had discovered Easter Island. Some authors also claim that Davis’ island was submerged beneath the sea shortly after the pirate ship had sailed past it 42. Approximately fifty years later, various English navigators (Byron, Carteret ...) continued to search for the island but failed to find it. In 1769, Monsieur de Surville, of the Pondichery Company, who was commander of a French ship, Le Saint Jean Baptiste, reported that he had just visited an unknown island, at 27º 30' south, that was more than 600 kilometers from Chile 43. In 1770, the Viceroy of Peru, Don Manuel de Amat y de Junyent, fearing that the French (through the Pondicherry Company) or the English might claim Davis’s Island (! ), sent a warship, the San Lorenzo, under the command of Don Philippe (sometimes also written in Spanish archives as Felipe) Gonzáles de Haedo to claim the island for Spain. The warship was accompanied by the frigate Santa Rosalia, under the command of Frigate Captain Antonico do Monte (or Domonté). González found the island, set up three crosses on little hills in the west of the island, named the island San Carlos, and had Aguëra draw the first map. In addition, one of his officers wrote a very interesting account of their stay on the island 44. Another ship left for the island on January 13, 1771 45. The reports of this voyage and the earlier one proved to be of great interest to Viceroy Amat and he ordered another visit to San Carlos and gifts for the natives to establish friendly relations. Thus, on October 2 1772, the frigate Aguila raised her anchor for the third expedition 46. The officers completed the map started by Aguera, made a detailed plan of the bay, known as Gonzales Bay, and compiled a vocabulary of the “Indians of San Carlos” 47. Starting on March 11, 1774, the famous Captain James Cook spent eight days on Easter Island, which he still referred to as Davis’s Land! He reported that the natives called the island Vaihou 48. In 1786, La Pérouse, commander of the Boussole and the Astrolade, landed in Hanga O ‘onu Bay (Tortoise Bay) to study the island. This bay became known as La Pérouse Bay. This great navigator studied the island and its inhabitants and then, having determined his geographic position exactly, he outlined the contours of the island. In 1804, the island received a visit from a Russian ship, the Neva, commanded by Urey Lisiansky. Subsequently, many adventurers and whalers visited the island and treated the islanders with great brutality. For example, in 1805, the captain of an American schooner, the Nancy, out of New London, was hunting seals around Mas a Fuera Island and needed extra hands. He went to Easter Island to take a few of the natives by force. He descended on the peaceful and basically unarmed islanders and he captured twelve men and ten women by brute force. However, by the following day, all that remained were the ten women because the men preferred to throw themselves into the sea rather than to remain captive. In 1806, a Hawaiian brig, the Kakou-Manou, under Captain A. Adams, was unable to land because of the aggression of the previous year. Captain Amosa Delano sailed to the island in 1808 and, in 1809, Captain Winschip sailed there on the Albatross. In 1811, when the American ship Pindos landed on the island, the second in command, Mr. Waden, shot one of the natives dead! In 1816 49, the island received a visit from Otto von Kotzebue, captain of the Russian ship Rurick, on his second voyage around the world. Among the travelers on board were the poet von Chamisso and the painter Louis Choris (Figure 31), who only made some drawings from a distance (view of Hangaroa; natives on the shore and on a watch tower) because the islanders would not allow anyone to land. In 1825, F. W. Beechey and E. Belcher, commanders of the Blossom, landed on the island hoping to study the northern part of the island (there was a violent fight between the sailors and the islanders). 1826 saw a visit from P. Blith, and 1829 saw a visit from Captain Thibaud (from Nantes). In 1830, Admiral A. Dupetit-Thouars brought the frigate La Venus to shore in search of provisions. In 1843, Monsignor E. Rouchouze, the first Apostolic Vicar of Eastern Oceania, accompanied by 24 monks and nuns, stayed for an unknown length of time on the island. Nothing was ever heard from this group and it is likely that all were massacred 50. In 1852, the English frigate Portland sailed to the island, and in 1862, the French sailing ship Le Cassini dropped anchor. Its commander, Captain Lejeune, studied the islanders and then went on to Valparaíso. It was conversations with Lejeune that convinced the Reverend Fathers of Picpus to send missionaries to convert the islanders. In the same year, just a few months later, the unfortunate islanders fell victim to brutal aggressors. Seven Peruvian ships, including the Cora and the Rosa y Carmen, commanded by Captain Aiguire 51, set out to sea planning to capture natives from the various islands of Polynesia and sell them as slaves. They did succeed, unfortunately, in the first part of their plan and they brought these poor islanders, as workers, from the Gambier Islands, the Marquesas Islands and the Poumotus. On these last islands, they came up against the French resident who chased them away and even commandeered one of their ships. Unfortunately, the old resident, a poor sailor, was unable to catch up with the other ships and the six that managed to escape were able to reach Easter Island a short time later. There, thanks to a display of trinkets, they were able to gather a large number of islanders in one place. Then, on a sign from the evil Captain Aiguire, eighty of the Peruvian bandits attacked the natives. Many were killed, others were wounded and threw themselves into the sea, and others tried to flee into the hills. Those who remained were taken prisoner, after vain attempts to defend themselves with their poorly constructed obsidian-tipped lances and wooden clubs against the cowardly Peruvian aggressors and their guns. There were about one thousand prisoners, including the king, Maurata, and his family (two boys and a girl), and all the island “sages” or wise men. A few days later 52, the men of the Cora tried to do something similar on Rapa Island but the natives defended themselves successfully and even captured one of the ships, which they sailed to Tahiti, where the crew was tried and imprisoned (Report of Monsieur Lavigerie, Surrogate Prosecutor; February 21 1863). The unfortunate Easter Islanders on the other five ships were taken to the guano mines, some to Callao and some to the Chincha Islands. Here, the poor, despairing, maltreated, malnourished and overworked islanders fell sick and, within a short time, four-fifths of them had died 53. Fortunately, two decent and kind-hearted men — both of whom were also French — were able to intervene on behalf of the survivors: Monsieur de Lesseps, who was then Consul General in Lima, and Monsieur Eugène Eyraud, a businessman in Valparaíso. Thanks to the former, those few islanders who had survived were put on a ship to be returned to their native island. Unfortunately, one of them was infected with smallpox and transmitted it to all his companions on the ship. Thus, during the voyage back to the island, 75 natives died and the fifteen who survived infected the entire population of the island on their return. Smallpox was a new disease on the island and none of the islanders had any immunity. Since the islanders also had no knowledge of hygienic practices and received no medical care, the symptoms of the disease were very serious. As a result, more than half of those who had survived the raid by the Peruvians perished. During this time, Eugène Eyraud took charge of the six natives on the Favorite, one of whom was Tepito, the son and heir of King Maurata, and brought them back to the island (May 1863). Eyraud remained on the island for nine months before he was able to leave on the Teresa Ramos. In 1864, having received the orders as a member of the Picpus Fathers, Eyraud returned to live on the island, accompanied by Father Hippolyte Roussel. In October 1866, the three-masted sailing ship Tampico brought two additional missionaries from Chile, Father Gaspard Zumbohm and Father Théodule Escolan. In November 1868, the island was visited by the HMS Topaze which brought back one of the great stone statues to the British Museum, where it can be found today. On board the ship, which was commanded by a Captain Purvis, was a doctor, J. H. L. Palmer. Captain Peter Arup also visited the island in 1868. In November 1868, Father Zumbohm returned to the island with a large number of domestic animals and plants that he hoped would become acclimated and would help to eliminate the periodic food shortages. The same year brought Dutrou-Bornier, a retired captain in the merchant marines 54, who wanted to farm on the island. In 1869, Bornier made the trip to Tahiti to set up a business arrangement with a rich Englishman, Mr. Brander, and then he returned to Easter Island. In 1870, the corvette O’Higgins, under the command of Don José Anacleto Goñi, dropped anchor at Easter Island to collect provisions during a training voyage for Chilean naval cadets. The captain of the corvette, Don Ignacio L. Pana, and the commander, as well as their junior officers took advantage of their time on land to study the islanders, their customs, their traditions etc. etc. and made the first detailed map of the island. They were assisted in their efforts by the two Frenchmen who were living there at the time, Father Roussel and Dutrou-Bornier 55. Using planks from wrecked ships, Dutrou-Bornier had built himself a house at Mataveri and had married the Queen of the Island, Koreto 56, who had given him two daughters, Caroline and Henrietta. Around his house, above which waved the French flag, there were approximately thirty huts that sheltered the natives who worked for him in his vineyard and in his fields of sugar cane and who took care of the horses, cows and sheep that he had brought to the island. Dutrou-Bornier was so full of energy that he had even built a little port at Hanga-Oika 57, where he docked his sailboat. 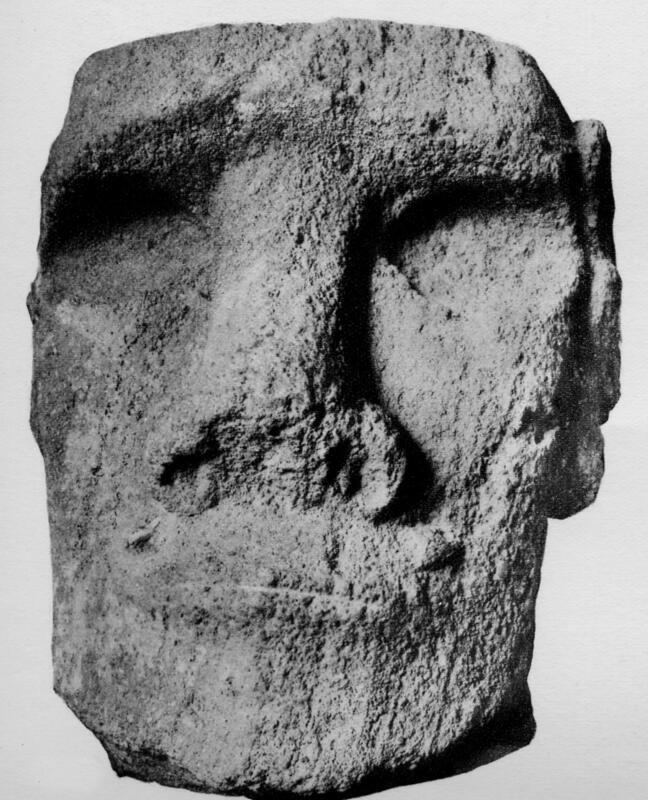 On June 24 1871, N. N. Mikloukho-Maclay, the commander of a Russian ship, the Vitjazj, stopped briefly on Easter Island and then continued to Mangareva, where he spent several days gathering information about Easter Island from Father Roussel, who, because of Dutrou-Bornier’s hostility, had left the island with a small number of islanders! The Russian then sailed to Tahiti and, while he was there (from July 22 to 24), Monsignor Jaussen gave him an engraved wooden tablet from the Easter Island. In 1872, a French corvette, La Flore, under the command of Vice-Admiral T. de Lappelin, together with Commander Jouin, Doctor Aze and the aspiring author Viaud (Pierre Loti) etc., landed at Hanga Roa to take away, just as the English had done but four years later, one of the great statues for the Paris Museum. Now, six months before the arrival of the corvette and as a result of his quarrel with Dutrou-Bornier, Father Roussel had left the island, taking with him some fifty converts 58. Thus, upon disembarking at Hanga Roa, Admiral Lappelin found only one foreign settler who could give him any information, namely the Dane, Smith 59 (Dutrou-Bornier was temporarily absent). The Dane had been on the island for only a short time and had not yet even visited the Rano Raraku crater! Furthermore, while the Topaze had been able to sail away with an entire and particularly handsome statue, she had had a crew of 300 sailors, special equipment and, in addition, 300 natives had been hired to help. By contrast, La Flore could provide only about 100 men ... equipped with a few ropes 60. Pierre Loti, who was in charge, was unable to attack the colossal statues at the Rano Raraku crater and was only able to set his sights on a statue at Ahu Karororoa (or Ahu Orongo) at the shore. And even these statues were so heavy, even without their turbans [topknots or pukao], that he had to settle for just a head ... which he still had to detach from the body. Fortunately, the statues were made of soft trachytic stone and the head could be separated from the body with a saw, the only tool that the expedition possessed. That was how Loti was able to carry off a head, which, after some time at the Paris Museum, is now in the Trocadéro Museum in Paris. The Chilean vessel O’Higgins made a second trip to Easter Island in 1877 under the command of Commander Lopez. In 1877, Alphonse Pinart, a passenger on the Seignelay, landed on Easter Island on Easter Sunday! He studied the island and its inhabitants and, like Pierre Loti, he collected a large number of objects that he gave to the Trocadéro Museum, as well as skeletons (which he collected together with Dr Thoulon) that he also donated to the Museum. He published an excellent study of the island, with many very interesting sketches, some of which show petroglyphs. Also in 1877, an American sailing vessel, the Black Eagle, was wrecked on the reefs 61 near the island and the crew was forced to spend six months there. Two years later, Salmon replaced Dutrou-Bornier in the Dutrou-Bornier/Brander business arrangement because Dutrou-Bornier died as the result of an accident 62 in August 1876. Salmon and Brander continued the activities that Brander had initiated, namely, the raising of livestock and the organized and extensive search for objects of archaeological interest. These objects were sold to Geiseler, to Thomson and to various museums. Brander died in 1887 and Salmon left the island in 1888. In 1882, the island received a visit from the English warship Sappho, under the command of B. F. Clark, and the German warship Hyaena under Captain Geiseler, with Weisser as a passenger. 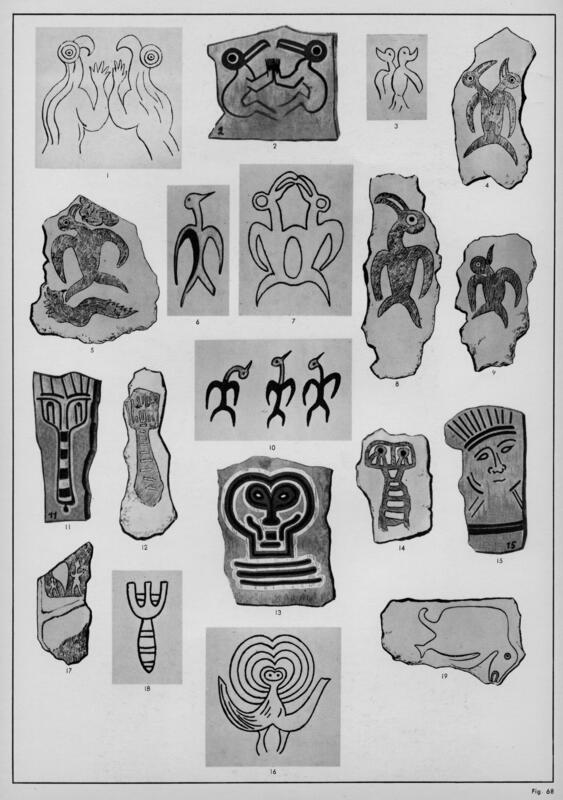 Geiseler and Weisser took very interesting notes; they discovered the paintings in the houses at Orongo (Figure 68) and bought ancient objects. On December 19, 1886, the Mohican dropped anchor, with Paymaster William Thomson and Dr. G.-H. Cooke on board.... Thomson’s detailed research resulted in a very interesting book and Cooke also made some interesting observations. They took back to the Washington Museum 63 a stone statue, some painted slabs, and various objects and tools (axe heads, etc.). Father Zumbohm returned to the island in 1887. In September 1888, the Chilean Commander Don Policarpo Toro, who arrived on the Angamos, spent some time on the island after claiming the island, which had been abandoned by France 64, for Chile! In 1888, Father Albert Montiton, a Frenchman from Normandy who had been a missionary among the Poumotus, arrived together with Monsignor Verdier. The next three years brought, respectively, a third visit by the O’Higgins, the beaching of Don Policarpo Toro’s ship, and a brief visit by the warship Abtao. The O’Higgins, a training ship for the Chilean Navy, returned in 1895. In 1897, H. Merlet arrived from Valparaíso, with a major plan for raising sheep on the island. Later, he ceded his rights to the English company “Williamson-Balfour”, which still exists 65. Father Georges Eich, the Provincial of Tahiti, also visited the island in 1897 and, in 1900, Father Isidore Butaye, a missionary on the Gambier Archipelago, visited briefly to bring comfort and consolation to the islanders who had basically been abandoned by the Archdiocese of Santiago, with which they had been affiliated. In 1901, the French ship La Durance stopped at the island and the ship’s doctor, Dr. Delabaude, excavated a pakeopa 66, collected some skulls and pieces of obsidian etc. and took some very interesting photographs. Three years later, Alexander Agassiz, commander of the Albatross and the Mohican, landed on the island and made the first geological survey. In 1905, a Chilean naval training vessel, the General Baquedano, delivered a group to the island that consisted of Dr. Walter Knoche, E. Martinez Calderon and F. Fuentes. These scientists took meteorological and seismological measurements, made an ethnological study, and took away a statue from a site close to Hanga Roa. In 1911 Father Valenzuela visited the island and in 1913 Father Don Ismael visited, returning the following year. In 1914, the General Baquedano arrived to put down a revolt against the Chilean representative, Edmunds, which was led by a kind of prophetess, Angata. From then on, this ship came to the island on a yearly basis. In 1914, from October to December, six German war cruisers dropped anchor, proving that we [the French] should have seen the value of retaining the island. They sunk the French sailing ship Jean near Hanga Roa 67. In 1915, Katherine Routledge, after completing some excellent ethnologic research in Africa (studying the Aki-Kuyu 68), organized an expedition to Easter Island after having completed extensive preliminary research, in particular, in the library of the Picpus Fathers at Braine-le-Comte. She arrived on the yacht Mana and, during her prolonged sojourn on the island, she interrogated the islanders at length and studied the island methodically and in great detail. She published her results in a well-documented and well-illustrated book 69. In 1916, Monsignor Edwards, accompanied by a Chilean military chaplain, spent close to two months on the island. He returned the following year with Father Bienvenido de Estella and Brother Modesto de Adias. In 1918, Father Bienvenido returned with Father Domingo de Beire. Father Bienvenido studied the island and its inhabitants and produced two very interesting monographs. Father N. Coreu spent eight months on the island in 1920 and a training ship with its naval chaplain visited the island during each of the next three years. From July to December 1923, the New Zealander MacMillan Brown conducted numerous ethnologic studies on the island. In 1925, Baron von Teuber visited and Father Regis Abgrall spent some time on the island in 1927. In 1930, the Swedish botanist Skottsberg visited the island, after he had been to Juan Fernández Island, and did some serious research. The American R. J. Casey visited very briefly in 1931 and wrote an account of his trip and, in 1932, the American Museum of Natural History decided to send an expedition, led by Templeton Crocker, on the yacht Zeus. A total of at least 73 ships sailed to Easter Island prior to 1933, bringing sailors, missionaries and/or scientists, who studied all aspects of the island and its native inhabitants 70 . To close this section on the history of the island, we must note, alas, that in spite of the voyage of the Saint Jean Baptiste in 1769 71 (the first [by a European] since Roggeveen’s voyage to the island); in spite of the scientific research of La Pérouse and then by Dupetit-Thouars; in spite of the surveys by the officers of the Cassini, the La Flore and the Seignelay; in spite of Jean-Baptiste Onéxime Dutrou-Bornier’s establishing himself on the island and the conversion of the islanders by members of a French religious order; in spite of the fact that the Queen of the Island, the wife of a French officer [Dutrou-Bornier], made a formal request that the island become a French protectorate and in spite of the fact that this request was repeated by the islanders in 1887, to the Governor of Tahiti, Monsieur des Essarts ... the [French] Ministry responsible for Marine Affairs responded negatively. And so Chile purchased the lands and the livestock from the son of the first Mr. Brander (who had died in 1877) and then, in September 1888, took over the entire island 72. Subsequently, in 1897, Merlet, a settler from Santiago, came to test out a new method for exploiting Easter Island and to take advantage, in his turn, of the unfortunate islanders. Since that time, an English firm, Williamson and Balfour, has set itself up on the island and sells, annually, the many tons of wool that are produced by the 40,000 sheep that it owns. We should add, furthermore, that it is also infinitely to be regretted that, before 1860 [sic], for example, the French Government failed to see fit to send an expedition to Easter Island that could have studied the last islanders, who were still numerous and still unsullied by cross breeding with outsiders (which occurred since that time), and who still had their own traditions and religion, their king, and their wise men, who knew how to read their “talking tablets”. In addition to all such documentation, such an expedition could have brought back many “talking tablets”, called “clever wood that can speak” (which were, in fact, collected by Russian, Chilean, English and American expeditions and of which not one French museum has a single example); the statue — the most beautiful and interesting of all the statues, which the English had the brains to go and unearth and then bring back to the British Museum; the best painted tiles 73, which are now in the United States; etc.... All these ancient objects were collected, at the end of the nineteenth century by the expeditions brought by the O’Higgins, the Vitjazj, the Topaze, etc. and especially by the expeditions led by W. J. Thomson and by S. Routledge. Alas, the results of this negligence on the part of the French cannot be reversed, except with respect to the stone statues. After making an agreement with Chile, the French Government could decide, one day, to send an expedition to Easter Island with the appropriate heavy equipment for removing, in its entirety, one of the most beautiful and monumental statues from Rano Raraku and also, copying the Americans, a statue from pakeopa — but complete and with its red turban [topknot or pukao]. It would be still be well worthwhile to organize such an expedition with these two goals, in particular, in mind. Otherwise, what would be the point of a French expedition to the island, given that there remain only a few native islanders, the results of extensive interbreeding with outsiders, who know nothing about their past and no longer have a king, a queen, priests, wise men, wooden tablets or any ancient objects? There is so little left on the island that antique native artifacts and wooden tablets can no longer be studied on the island and can only be examined in museums and collections in Europe and America. Similarly, the statues, carved rocks and remains of ancient dwellings have been studied, sketched and photographed in such detail that there is no point, in my opinion, in anyone going to the island to study them further 74. By contrast, an expedition could be organized, as noted above, to go and dig up one or two entire statues for our Ethnographic Museum. In addition, there is another issue that has not been studied in sufficient detail and is of great current interest since the race of native islanders has died out 75, namely, the nature of the race of the islanders who lived on the island at the end of the eighteenth century! But this kind of expedition would need a leader who was not only a true ethnographer but also a doctor, who was especially well trained in anthropology and (as we shall demonstrate below) in endocrino-pathology (including the analysis of old materials). 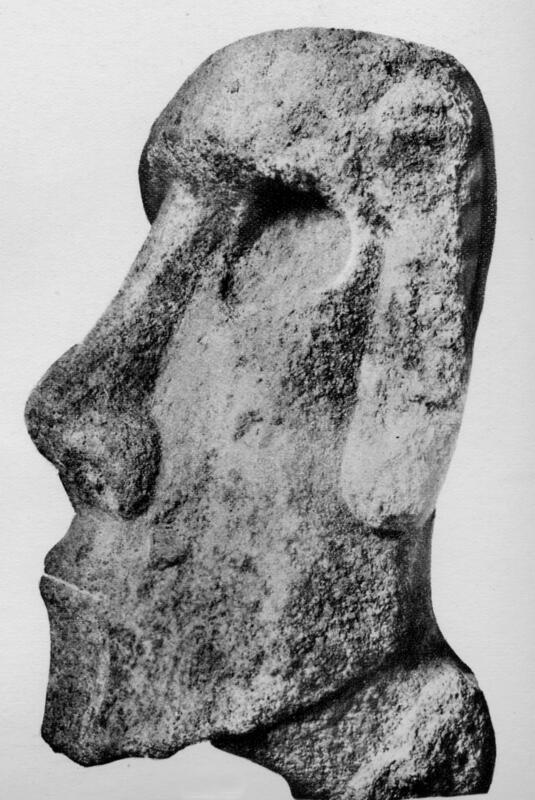 Indeed, in order to be able to perform a competent study of the few rare islanders who remain and still have some of the characteristics of the original race of “Easter Island Polynesians”, it would be necessary (i) to understand in depth, from an anthropological perspective, all the other Polynesian, South American and even Indo-European races; and (ii) to be able to discriminate the somatic modifications that are due to interbreeding from those that are due to the involvement of certain pathologic factors. Everything that could not be carried off the island has been studied in minute detail and sketched and photographed on site during the long visits to the island of professional ethnographers, who, prior to their visits had acquired a vast store of knowledge and the necessary training in scientific discipline, as well as experience on earlier meticulously executed ethnological expeditions, such as Thomson and Routledge. Since everything has been drawn and photographed by A. Pinart, Pierre Loti, Bienvenido de Estella, W. J. Thomson, S. Routledge, Delabaude, etc.... (and even panoramically by S. Routledge), there is not even any point in filming anything on the island 76 because, in the case of stationary objects of artistic or scientific interest (statues, carved rocks, painted stones, etc. ), photography, which allows the production of well-lit and well-positioned images with the correspondingly objective detail, is preferable, from an artistic and documentary perspective, to cinematography. Moreover, on Easter Island, cinematography would be particularly useless (with the exception of the above-indicated documentary views) because the center of the island is deserted and, with respect to the landscape, of no interest at all 77. 26. Editor’s note: There seems not to have been a "name" for the island in Rapanui; it was simply a place, and here were its people. As there was no contact with other islands, there was probably no need to distinguish it from others. 27. Editor’s note: La Pérouse Bay is located on the northeast coast, not the south coast. 28. According to traditional stories still told by the old men on the island, their ancestors came, several centuries ago, from an island far in the East, called Rapa. In fact, such an island does exist and its name is Rapa-Iti or Little Rapa. Thus, it would have been in memory of this distant homeland that the island was named Rapa-Nui or Great Rapa. It should be noted, however, that some authors have suggested that the islanders never had a maori word that would allow them to distinguish between their island and others at a greater or lesser distance across the ocean. 29. Translator’s note: Chauvet uses the French word "milles" rather than giving the distance in kilometers. The island is, thus, the most easterly island in Polynesia (making "Easter" Island into a modest pun). Editor’s note: The correct longitude and latitude for Easter Island are 27 8'3" south by 109 26'10" west. The island is actually 2,300 miles (3,700 kilometers) west of mainland Chile and 2,515 miles (4,047 kilometers) east of Tahiti. 30. Editor’s note: The island actually covers 171 square kilometers (66 square miles). 31. In maori, the word rano refers to a hole with water in it. This proves that, when the natives first arrived on the island, the volcanoes had already been dormant for a long time. Some authors have referred incorrectly to the second and third volcanoes as "Rano-Harue" and "Rano-Utu-iti", respectively. 32. Pinart wrote that it is 1,500 meters in diameter and 800 meters deep. Editor’s note: Rano Kau is 300 meters (1,000 feet) high. 33. Editor’s note: It is not flat but steep and hilly. This statement could only be made by someone who never visited this site! 34. Editor’s note: Maunga Terevaka is the highest mountain on the island, at 1,748 feet (536 meters). Rano Aroi is a small crater on its slope and is 656 feet (200 meters) high. 35. Editor’s note: Rano Raraku is 525 feet (160 meters) high and 2,133 feet (650 meters) in diameter. 36. Editor’s note: The statues are facing downslope, which just happens to be north. 37. Editor’s note: Chauvet wrote "kau" instead of "hau", one of his many spelling errors. Where possible and appropriate, spelling errors have been corrected by the Editor in order to make the text easier to read. 38. Because it is so difficult to get into the crater, these bushes are the only ones that have managed to escape the predations of free-roaming animals; such animals have, in fact, destroyed all the ancient vegetation that used to be found on the island. 39. Editor’s note: While true for some areas, several parts of the island have deep soil deposits. 40. Editor’s note: Chauvet is in error — there are fresh water springs on the island. 41. Editor’s note: Jacob Roggeveen did not land on Easter Island on April 6, 1722. The watch on the Afrikaansche Galey, which was ahead, discovered land in the evening on Easter Sunday, April 5, and reported this to the other two ships that were not yet in view of the island. Roggeveen ordered all to lower sail and lay by until dawn the next day. In the evening of the 5th he wrote in his journal that he called the island "Easter Island" because it was Easter Sunday. It was only the next morning, April 6th, that the crews of the other ships saw the island (and Behrens made his entry). They then started circling the island, looking for a suitable anchorage and didn’t actually land until April 10th. "Paasers" is not Dutch for "Easter"; it is derived from Paascheiland (= island) and it refers to the inhabitants. 42. Editor’s note: Whatever the pirate Davis saw, or thought he saw, it was not Easter Island. The "disappearing island" story was often mentioned in newspapers in the early days of island exploration. These rumors were triggered by ships that missed the island, and assumed that it must have sunk beneath the waves. The November 17, 1922 edition of the London Daily Mirror featured the following coverage: "Two more violent earthquakes occurred yesterday in the Coquimbo region followed by a tidal wave.... It is feared that Easter Island has disappeared...". Around the same time a Santiago newspaper reported that the wireless station on the island failed to reply to repeated calls; however, there was no wireless station on the island! On March 14, 1923, the Washington Post reported that Easter Island disappeared, according to a report from a merchant ship that was unable to locate it. 43. Editor’s note: The Juan Fernandez Islands are located 690 kilometers (430 miles) from the Chilean mainland, but the coordinates do not match. There are no other islands that are at that distance from Chile, nor at that latitude. 44. The crosses can easily be seen on the map, which is reproduced in Figure7b (Archives of Seville). The islanders did, however, knock them over the day after they had been erected. The map and the report of the expedition were prepared by Don Felipe Gonzáles on his return to Chile, when he was living in the Fortress of San Carlos de Chiloé. He sent them from there to the Viceroy in Peru on January 3 1771. Chauvet noted here, too, that the manuscript written by the officer had recently come up for sale in London at a price of 70,000 French francs. 45. Editor’s note: Chauvet gives no details; what ship this may have been is unknown. 46. Editor’s note: There is no evidence for this second trip to the island by Gonzáles. 47. Don Philippe Gonzáles estimated that the voyage from Chiloé to San Carlos took about 20 days, while the return journey required only six or seven. Thus, it might be quite dangerous to leave foreigners to settle on this island, which, he said, was so close to Peru. 48. Editor’s note: Vaihu is on the south coast of the island at Hanga Tee. 49. Editor’s note: It was actually 1815. 50. Editor’s note: There is no record for this group, and no evidence of any such massacre. 51. Editor’s note: The Cora was under the command of Captain Aguirre; the Rosa y Carman was commanded by a man named Marutani. As related by Chauvet, this account of the slave raids is somewhat incorrect. For a more accurate account, the reader is directed to H.E. Maude’s 1986 Slavers in Paradise (Stanford University Press). 52. Editor’s note: Rapa Iti is far to the west of Easter Island; the ships may have sailed from Easter Island a few days later, but it took weeks to sail the distance to Rapa Iti. 53. Editor’s note: There is no evidence that any Rapanui ended up at the guano mines on the Chincha Islands. They were instead sold in Peru as laborers and household servants. 54. Editor’s note: Dutrou-Bornier had been an officer in the Crimean Army. 55. A little later four other foreigners settled on the island, namely, two additional Frenchmen, a Dane called Adam Smith, and a Chilean. 56. Editor’s note: Koreto seems to have declared herself "queen". 57. Editors note: This surely must be Hanga Piko, a small port on the west side of the island. 58. Editor’s note: 168 Rapanui left for Mangareva with Roussel. 59. Editors note: The name was Christian Smith (or Schmidt). 61. Editor’s note: The island does not have reefs (but there are small, deep coral formations); the ship must have crashed into the rocky shoreline. 62. Editor’s note: Jean-Baptiste Onéxime Dutrou-Bornier was murdered by islanders. 63. Editor’s note: The Smithsonian Institution in Washington DC. 64. Editor’s note: France never claimed the island. 65. Translator’s note: Chauvet refers to the period of time in which he is writing. 66. Editor’s note: Chauvet uses "pakeopa" in place of "ahu". Ahu is the correct term. 67. Editor’s note: The Jean was bombarded and sunk by the Germans, within view of the island, and much to the puzzlement of the Rapanui who were unaware that war had broken out. 68. Editor’s note: This is not the correct name of the tribe; Routledge lived amongst and studied the Kikuyu. 69. Editor’s note: The Mystery of Easter Island, published in London in 1919. 71. Editor’s note: There is no evidence of this ship ever arriving at Easter Island; Chauvet seems intent on asserting any and all French claims to the island whether substantiated or not. 72. In the same way, as a result of ignorance and incompetence, other [French] Ministries at other times have made similar errors of judgment, namely, in Cheikh-Saïd on the Arabian coast; in Samoa, which even used to have a French Archbishop and whose inhabitants, with their king at their head, came in 1878, to Afia [Apia] harbor, to ask Commander Rivière (on board the Vire) for French protection; in the sharing of German New Guinea; and in Mesopotamia [Iraq! ], with its prehistoric and more recent historic remains and its oil! etc.... Indeed, with respect to Easter Island, the Germans have taught us, at our expense, how useful little islands, even if they are deserted, can be for refueling bases for submarines, for coal and oil depots, and even for landing strips for seaplanes! Thus, for these three reasons, an island of this type, which is the only one half way between South America and the Society Islands (which are French), and which, in addition, can watch all the sea lanes between Panama and Australia, should have been taken over by the French! Once Chile had assumed control of the island, the Pope, at the request of The Bishop of Santiago and Monsignor Verdier, the Apostolic Vicar of Tahiti, turned over the mission in Rapanui to the Archbishop of Santiago. 73. Editor’s note: Chauvet here is referring to stone slabs taken from inside the houses at Orongo. Most of these have paintings on them; one (apparently a house post) has incised petroglyphs. They were returned to the island in the 1980s and are now in the island’s museum. 74. Editor’s note: Chauvet clearly was mistaken on this point. The research conducted on the island in the past years has revealed a great deal of new information. 75. Editor’s note: This is incorrect; while the population of Easter Island dropped to a low of 110 in 1877, it never "died out". 76. Editor’s note: At least two dozen films, documentary and theatrical, have been recorded on Easter Island over the years, including a 1935 film shot during the Franco-Belgian expedition. 77. Translator’s note: A footnote immediately after the last mention of Routledge in the text above states that the text (it is unclear how much) was added as an Addendum in December, 1933.